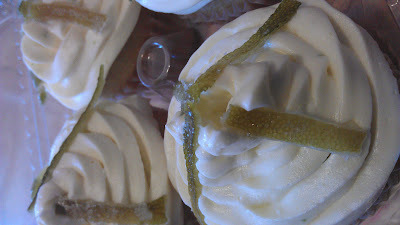 In my experimenting last weekend, I searched to find "a look" for my cakes, especially the Coconut Cream Cupcakes that are usually topped with Coco-Lime Buttercream Frosting or Coco-Lime Whipped Cream. I knew I wanted the topper to be green and could not think of anything better than a Candied Lime peel . Cupcakes and recipe below. Voila! Place peel strips in large saucepan and cover with water. Bring to a boil over high heat, then reduce heat and simmer 10 minutes longer. Drain. Repeat this process two more times.